Ready to roll coloured icing. Ready to roll soft icing. Ideal for covering cakes and biscuits. Mix colours to experiment with new shades. Mould to create models and patterns. No artificial flavours. Suitable for vegetarians. 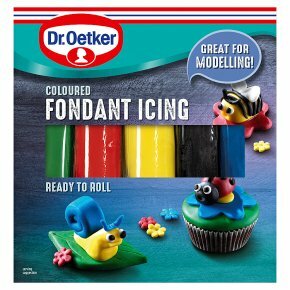 Dr. Oetker Ready to Roll Coloured Icing is perfect for adding a bold colour to your cake when kids baking or for a special occasion. Mix the colours together to create new shades, or use for moulding into decorations and models. Knead the coloured icing until soft and pliable and roll out on a surface lightly dusted with icing sugar. If applying directly to a cake use smooth apricot jam or a small amount of buttercream to secure the icing to the cake. To apply to a cake with marzipan or to white icing slightly moisten the surface with cooled boiled water. To achieve an extra smooth surface and remove any excess icing sugar, polish with the flat of your hand. Coloured Regal-Ice Ready to Roll Icing is suitable for covering or modelling.